At last. It seems like we’ve been working toward this inspection since we put up our first wall August 1 of last year. 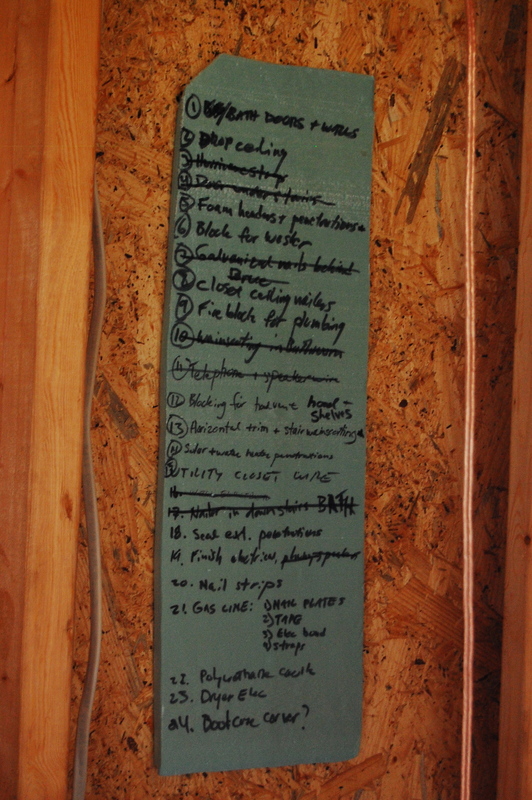 But finally, we passed the “rough-in,” a major inspection in which the framing and all the trades (the electrical, plumbing, HVAC, and gas) are checked off before they get hidden behind the insulation and drywall. The framing has been the biggest project. We love our tall ceilings, but we didn’t realize what a bear it would be to build. It is definitely a challenge to work so high, and it has added complexity and cost to the construction process. On the other hand, we love the spacious feeling. We are certain that our tall ceiling and large windows make our small house feel comfortable. If we had had more experience we probably would not have done it this way, but we are glad we did. Plus, we only have to build it once but we get to live in it our whole lives. 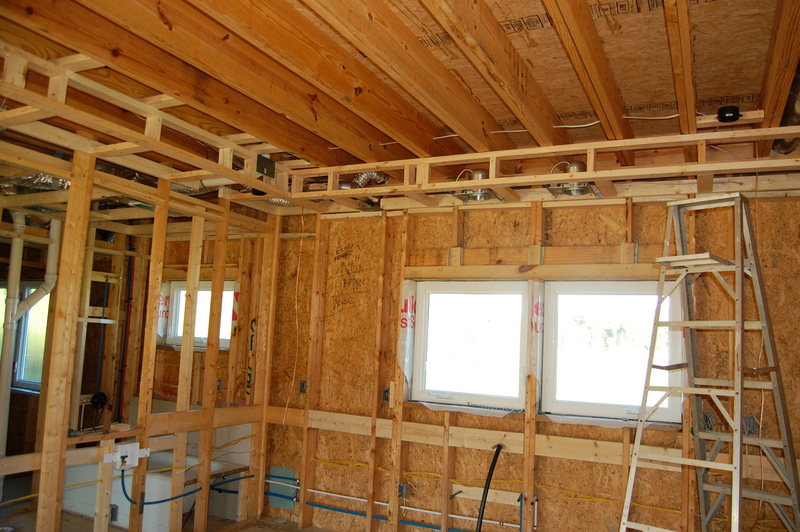 The height of our ceilings have made framing complicated and challenging. It is a good thing we didn’t know better, or we would have built a conventional roofline and ceiling. One of our numerous to-do lists. We’ve been working toward our framing and rough-in inspection since last March, when we put on the siding. The punch list to get this inspection has seemed endless. Blocking, in particular, was a never-ending project: nailers for drywal, nailers for cabinets, nailers for wainscoating, fireblocking, fireblocking, fireblocking… The amount of work to do with minimal visual changes was a bit discouraging. Still, we have had moments of triumph: One morning this week, with no insulation in the house and before the sun came through the windows, it was 38 degrees outside and 48 degrees inside. The thermal mass of our floor and careful air sealing have paid off. This winter, too, is the first time we can see the sun streaming in through our living room windows, and we love it. Hello solar gain! 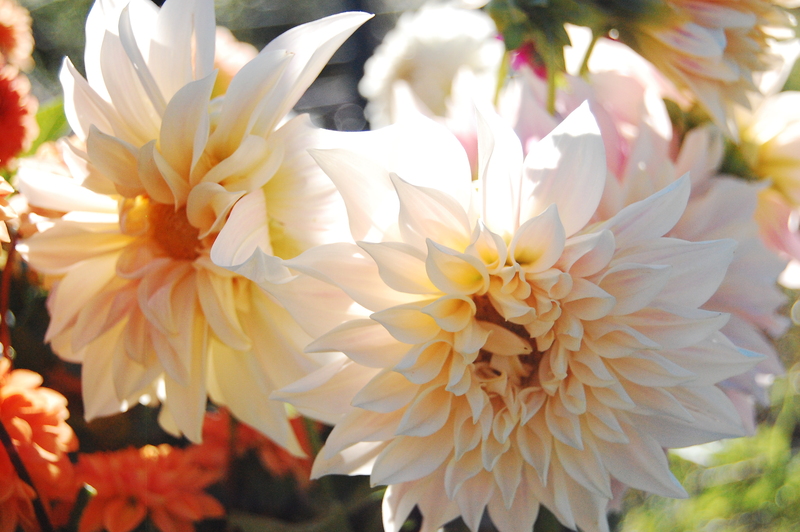 We can’t wait to sit in our window seat in the winter. Our second try at a used bathtub was just right. Doing our trades has been a steep learning curve. One of the first things we did was find a tub on Craigslist. (We had to get it in before the walls made it impossible. We found a used cast iron tub, hauled the White Whale to our front door, unloaded it from the truck, and realized the drain was on the wrong side of the tub! Fortunately, we were able to find another one that faced the right way. These suckers are heavy! When it came to the rest of the plumbing, we hired it out. There is only so much we can learn at once and we decided to tackle the electrical instead. That was definitely the right call. laying out the water supply and the slope and venting requirements for the drains would have been quite overwhelming. The electrical was the big job we took on ourselves. We hired an electrician friend to help us install the meter and electrical boxes and get started. We have 400-amp service, instead of the normal 200-amp service, because it hardly cost us any extra and gives us plenty of room to expand for our farm. 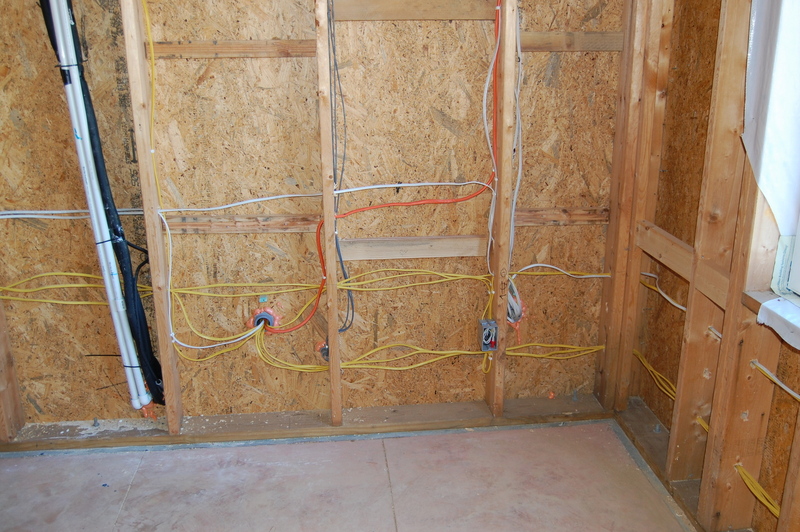 Running wire and making up the boxes for switches and receptacles took some practice, but we tried to keep it all looking neat. The kitchen has to have special circuits. Switch boxes are extra work. 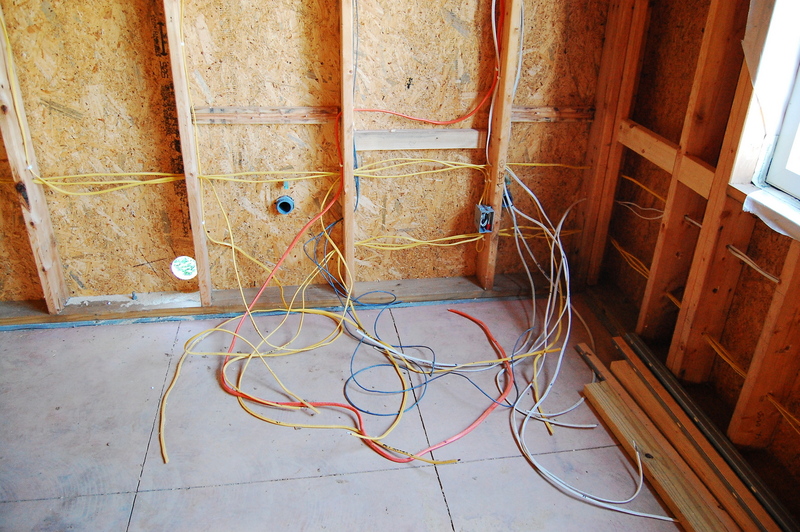 The place where it was hardest to keep it neat was where all the wires went to the exterior-mounted breaker boxes. The tangle of wires at the breaker boxes. However, even that spaghetti-farm cleaned up reasonably well. It looks a lot neater with the wire pulled through. All of the utility equipment is on one side of the house. 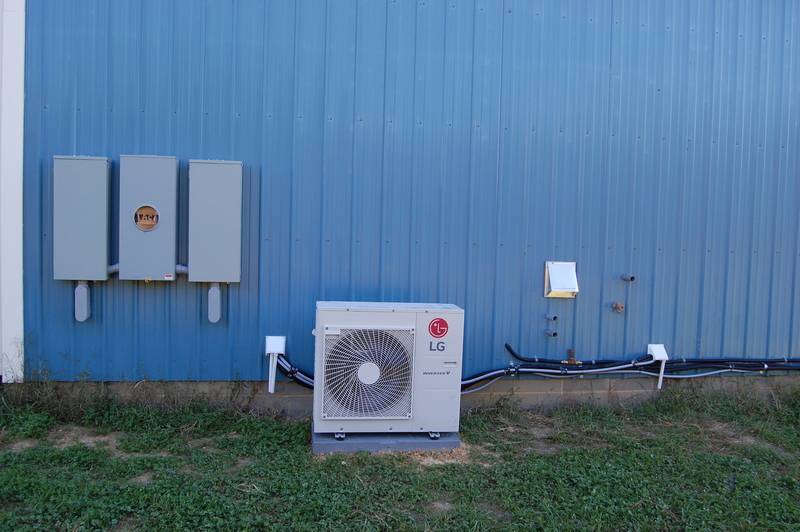 This photo shows our breaker boxes, HVAC compressor unit, and all sorts of coolant, electrical, and gas lines. The exterior on-demand hot water heater will eventually be mounted on this side, too. The utility side of the house. We also hired out the HVAC. Green Country Service installed our system for us, and they did a fantastic job. We had a lot to learn about HVAC and we discovered our original plan wouldn’t work. Without an attic or crawl space, we had limited options for Plan B. In a tight and energy-efficient house like ours, it can be difficult to size the air conditioner to cool slowly enough to dehumidify during our muggy summers. However, Green Country Service was able to spec and design a mini-split system for us that would do the job. Plus, we loved their installation crew. If you need any HVAC work done we definitely recommend Green Country Service. A mini-split uses a single outdoor compressor to send coolant to individually controlled indoor air handling units. (You may have seen units like these in hotels.) There is no duct work and each unit is controlled individually, so each room can be set for optimum comfort. Additionally, these units are very efficient and very quiet. Our system is 19.5 SEER, or “pretty dang efficient.” We have one air handler in each bedroom and one in the living room and kitchen area. The sleek indoor units are efficient and quiet. Our house design made installation a challenge. In addition to installing our mini-splits, Green Country Service installed ductwork for our kitchen hood vent, bathroom fans, and an Energy Recovery Ventilator (ERV). Modern, tight construction techniques offer vast improvements in energy efficiency, but can compromise indoor air quality by trapping contaminants and toxins in the house. An ERV brings fresh air into the house and exhausts stale air, improving air quality, comfort, and health. It also has a heat and moisture exchange in it, so you aren’t just blowing hot, humid summer air or cold, dry winter air into your nicely conditioned house. Installing the ERV required duct work to move the air around. 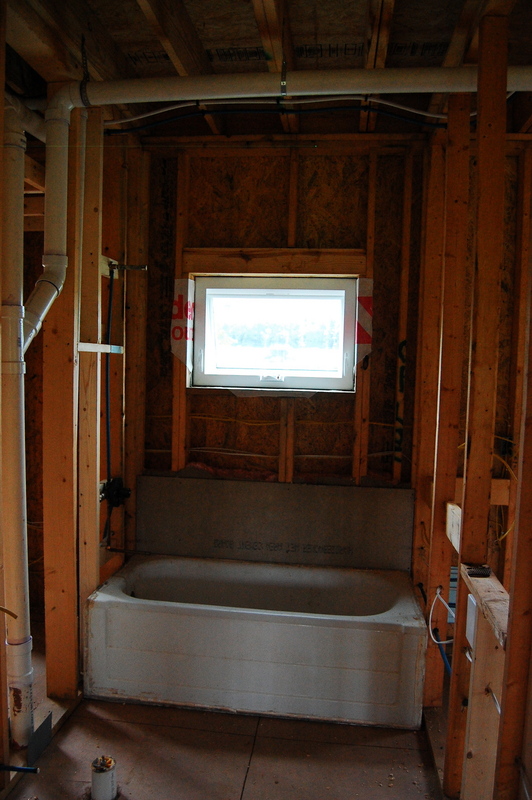 Without any attic or crawl space, we had to drop the ceiling inside and outside of the bathroom to create a space for the duct work. Duct work and dropped ceiling. We also had to create a dropped soffit in the kitchen to hide plumbing drains and HVAC ducts. We were daunted by all this extra framing, but with help from our friend Jamey it went pretty quick. We also like the way it looks. The change in ceiling height helps define the kitchen as its own room in our open plan. This soffit hides ducts and plumbing. It also adds nice definition to the kitchen. 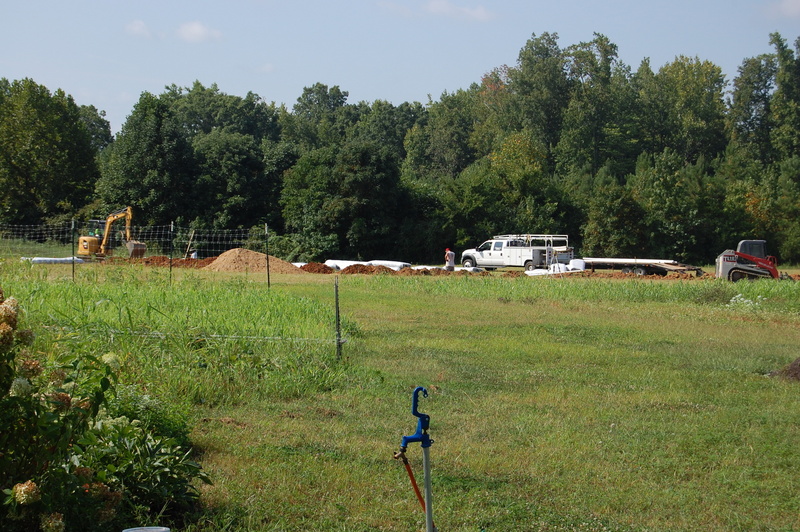 Finally, we’ve succeeded in crossing one more major project (and expense) off our to-do list: Our septic tank and leech field were installed. Retrac Lewis at Jimmy Lewis & Sons handled this for us. They were fast, reasonable, and did a great job. We’re planning on using them again for grading and driveway work right before we move in. It took heavy equipment and extra soil to install the septic. Our land only perked 200 feet away from our house. We were really impressed with their excavation and grading. We were nervous the day of our inspection, but it went fine. There were a couple minor things we had to correct and we had to negotiate about one aspect of our circuit layout, but it all went fine. 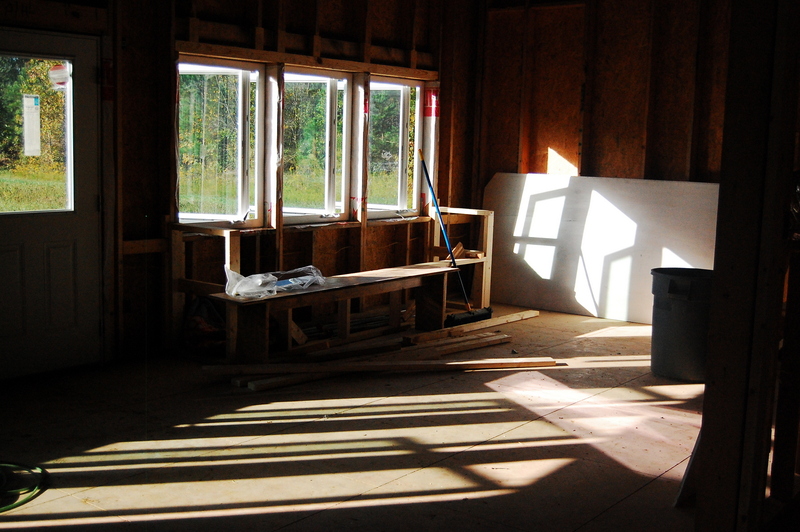 With this inspection behind us, we can move on to getting our insulation and drywall on. Of course, we have new lists to work through, but we are on schedule and within our budget, so we feel great. With an early killing frost last week, we have to turn our attention back to cleaning up the farm and planting the new peonies we ordered. First, however, we need a little break. These farmer-builders are off to the mountains for some rest, relaxation, and an honest-to-goodness (and futile) attempt to wear out the dog. Previous What the heck have they been doing on the farm? I could not possibly be more impressed with you two!! Amazing work and very exciting, I’m sure, to be this close to drywall stage! i’m very impressed by the progress of your new house. so many stages and important details. you are wonderfull and i wish you good luck !!! This is fantastic work, you two! I’m really impressed, not only with the construction details themselves (which look and sound top-knotch), but I’m hugely impressed with your overall goals and ideas on thermal efficiency. Great work!! Thank you for the support, everyone. We appreciate it.